Video shows content from our previous shows. Content for our upcoming show may vary. 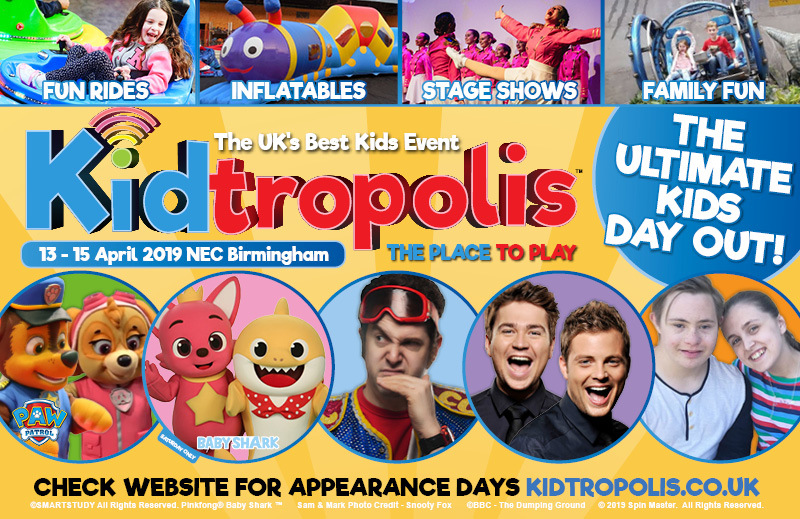 Please check our website and social media to find out what's coming to Kidtropolis in April 2019. Packed to the point of bursting, with live shows, children's character favourites, exciting entertainment, popular brands and endless activities; families won't find this much fun, all under one roof, anywhere else in the UK. Aimed at children aged 2-12, visitors can dive into the Messy Play area, take on the mini Labyrinth Challenge, whizz around the Roller Rink disco, ride the carousel, get creative with BRIO, ride on the Bumper Carz, test out soccer skills with Birmingham City FC, bounce on the trampolines, ride the sizzler and have fun on the activity Caterpillar, Croc Assault course and Land Zorbs**. Ruben Reuter and Kia Pegg as seen on CBBC's The Dumping Ground will be meeting and greeting fans at Kidtropolis every day at intervals. Do you know or have a little hero in your life who deserves to be recognised? Then PAW Patrol is offering a chance for you to help them shine with the help of their favourite pups! This year, the much-loved pups are celebrating 'real-life' little heroes in the PAW Patrol Little Heroes PAW Awards 2019 which are launching at Kidtropolis Birmingham! The PAW Patrol Little Heroes PAW Awards 2019 has EIGHT categories and anyone can enter! If you know or have a little hero in your life who is between the ages of 3-10 years and you would like to nominate them, you can enter the Awards by visiting www.PAWAwards.co.uk from 13th April, and sharing why this little one deserves to be one of the PAW Patrol Little Heroes of 2019. TV Royalty Sam and Mark as seen on CBBC's Big Friday Wind-Up and Copycats, will also host their live show jam packed with jokes and games, fun and laughs for all the family on Saturday 13th and Sunday 14th April 2019. Guinness World Record Breaking Captain Calamity returns to Kidtropolis with more fun, excitement and magic than a family size bag of rainbows! Expect jaw dropping science stunts, enormous balloons, beautiful bubbles, one or two custard pies and enough craziness to send you into fits of giggles before the final curtain comes crashing down at every session other than Sunday afternoon. PLUS, with the West End Kids performing on the live stage on Sunday 14th April and Flawless Dance School wowing audiences with their jaw dropping performance on Monday 15th April, this is a show not to be missed! Grab your tickets now! Don't miss your opportunity to be at the UK's Best Kids Event! * All ticket prices are plus an service fee and transaction fee and are available for a limited time. * For full terms and conditions, please click here . Please select the date and section you'd like to attend below. * Price excludes booking fee and transaction fee. Terms and conditions apply for all tickets. For visitor terms and conditions, please click here .